The authors will receive their awards at the SABR 49 national convention, June 26-30, 2019, in San Diego. 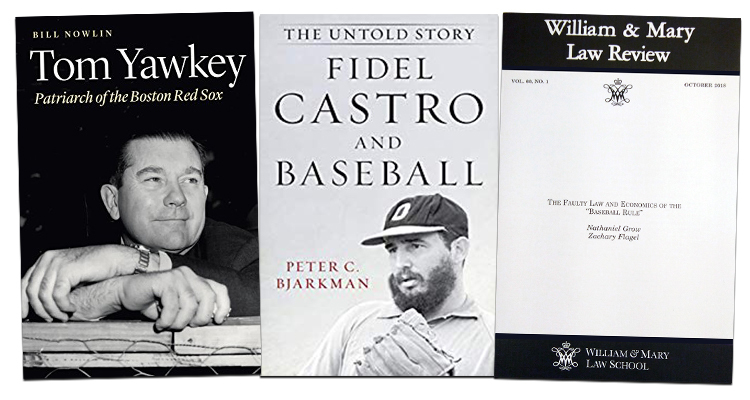 On Bjarkman's Fidel Castro and Baseball: "Prior to his death last year, Bjarkman was widely recognized as the foremost authority on baseball in Cuba. This book, his last, details the game’s central role in the governing structure developed by Fidel Castro in the late 1950s and practiced for more than a half century after that. It is an informed and insightful analysis of a sector of sports that has rarely been available for study." On Grow and Flagel's "The Faulty Law and Economics of the 'Baseball Rule' ": "The so-called 'baseball rule,' a legal structure generally holding baseball harmless from the potentially dangerous foreseeable consequences of attending a game, has been a standard of law for more than a century. In general, courts have found that fans assume liability for such threats as foul balls flying into stands so long as ballparks provide some protected areas. This paper presents statistical evidence for a re-thinking of that liability limitation. It is particularly interesting when understood in the context of the parallel move by MLB and its teams to extend protective netting in ballparks." On Nowlin's Tom Yawkey: "Tom Yawkey was a patrician with plebian tastes. His 40-year ownership of the Red Sox was one of the most controversial in baseball history in large measure due to his team’s distinction of having been the last to integrate its roster. Bill Nowlin applies his intimate familiarity with the Red Sox to this biography, which explores the controversies in a straightforward, unblinking fashion." Bjarkman (1941-2018) was the leading authority on Cuban baseball, a recipient of SABR's Henry Chadwick Award, and the author of many books and articles on sports history. Grow is an Associate Professor of Business Law and Ethics at Indiana University. Flagel is a student at the University of Georgia's Terry College of Business. Nowlin has served seven terms on the SABR Board of Directors, including as Vice President from 2004 to 2016, and he has authored more than 75 books and hundreds of articles about the Boston Red Sox and other areas of baseball history. The SABR Baseball Research Award is designed to honor projects that do not fit the criteria for the Seymour Medal or the McFarland-SABR Baseball Research Award. To see a complete list of SABR Baseball Research Award winners, click here. This page was last updated March 21, 2019 at 8:51 pm MST.